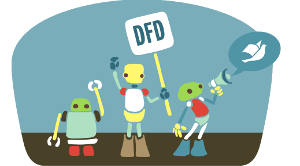 Document Freedom Day (DFD) is the international day to celebrate and raise awareness of Open Standards. On this day, people around the globe come together to run local events and let the public know about freedom of information accessibility. Join us by attending an event close to you, help spreading the word or see other ways of how to get involved. Every year, people like you and me run for Document Freedom around the globe. We depend on your creativity, enthusiasm and motivation to bring the message also to your home town. Help us to make a difference and join our community!